Financial Planning & Analysis and Performance Management is the essential desk reference for CFOs, FP&A professionals, investment banking professionals, and equity research analysts. With thought-provoking discussion and refreshing perspective, this book provides insightful reference for critical areas that directly impact an organization’s effectiveness. From budgeting and forecasting, analysis, and performance management, to financial communication, metrics, and benchmarking, these insights delve into the cornerstones of business and value drivers. Dashboards, graphs, and other visual aids illustrate complex concepts and provide reference at a glance, while the author’s experience as a CFO, educator, and general manager leads to comprehensive and practical analytical techniques for real world application. The most effective analysts are those who are constantly striving for improvement, always seeking new solutions, and forever in pursuit of enlightening resources with real, useful information. 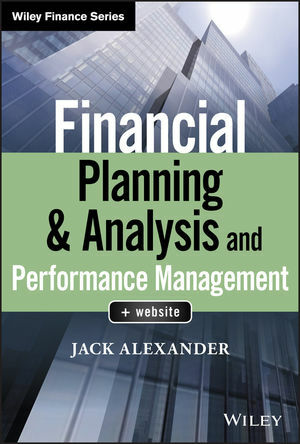 Packed with examples, practical solutions, models, and novel approaches, Financial Planning & Analysis and Performance Management is an invaluable addition to the analyst’s professional library. Access to a website with many of the tools introduced are included with the purchase of the book. JACK ALEXANDER is an experienced CFO and operating executive turned consultant, author, and educator. As the founder of Jack Alexander & Associates, LLC, he provides advice to businesses across a wide range of financial and operating areas, with a focus and passion on Financial Planning & Analysis (FP&A) and Performance Management (PM). The firm also offers customized training and workshops on FP&A. He is a frequent speaker on FP&A and PM. He is the author of Performance Dashboards and Analysis for Value Creation and Financial Planning and Analysis and Performance Management, both from Wiley.